We have more than 30 seminarians studying for the priesthood. They need your prayers and financial support to continue their studies. 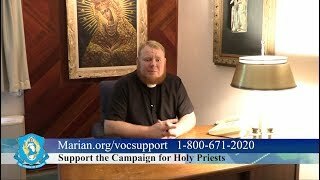 Father Allen Alexander, MIC, shares about how the priesthood is a gift for thousands of souls. We have more than 30 seminarians studying for the priesthood. They need your prayers and financial support to continue their studies. Father Donald Calloway, MIC, shares some of the trials men may experience while studying for the priesthood. Amid a nationwide drought in priestly vocations, the Marians continue to harvest a bumper crop of zealous men giving their lives to Christ and His Church. What's God up to? What goes into the making of a Marian priest?